While I was shopping at the grocery store the other day, I came across the cutest little silicone ice cube trays in fun shapes. They were only $2 each, so I had to pick up a few. And when I got home, I began to scour the house for something I could make dog treats with. We had some leftover watermelon from a birthday party we went to a few days before. I've seen a frozen tasty dog treat recipe with watermelon over at Sugar Golden Woofs' blog, so I thought that sounded like a good idea. Shiner is sure to like watermelon, right? Sorry lady, I'm busy right now. Come back when you have some meat and then we can talk. My adorable little watermelon stars were melting so we went back in the house. I put the plate down in front of her and that's when she decided to eat them. Yay - success! Well, if this is what you're offering I guess I'll eat it since I'm hot. While meaty treats are Shiner's favorite, she will eat fruity treats too if that's what's offered to her. But I don't think fruity treats are her absolute favorite. 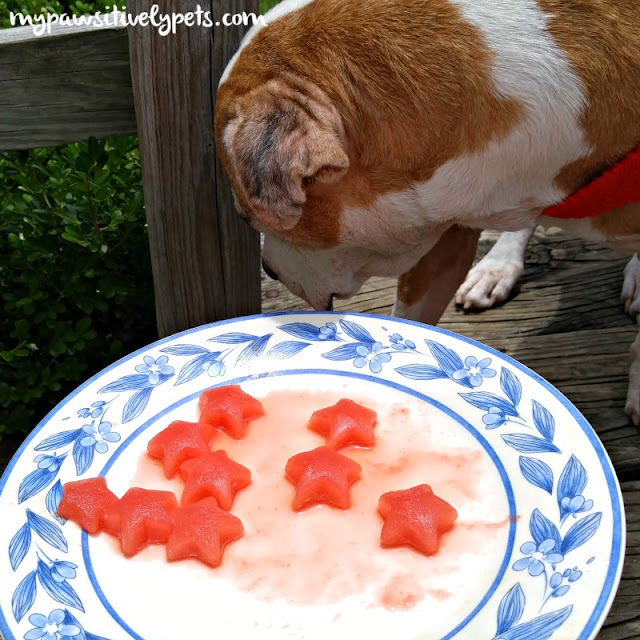 Giving watermelon to your dog is a good way to keep them hydrated when it's hot out. Freezing it makes it even cooler! Watermelon contains vitamins and minerals like beta-carotene, magnesium, vitamin A, potassium, and vitamin C. It's low in calories too. As with all dog treats, it should be fed in moderation. We hope you all have a SAFE and FUN Holiday weekend! What tasty treats will you and your dog enjoy? Looks like a perfect holiday treat! Happy 4th!! 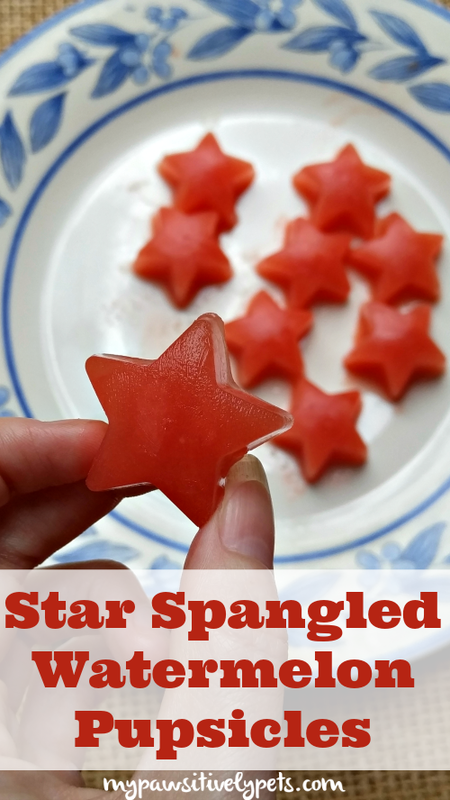 Red, white and yum! Happy Independence Day everyone!!! Those look pretty good. MOOOOOOMMMMMMMMM!!! We want some. Happy Fourth of July! Harley agrees with Shiner - he wants meat! Jax adores watermelon and would eat it till he got sick if I let him. While it's great that he likes something that's good for him, it makes it close to impossible for me to enjoy a slice from time to time by myself. LOL Enjoy your holiday Ann. Haha! Well, I know the feeling! What a great idea. 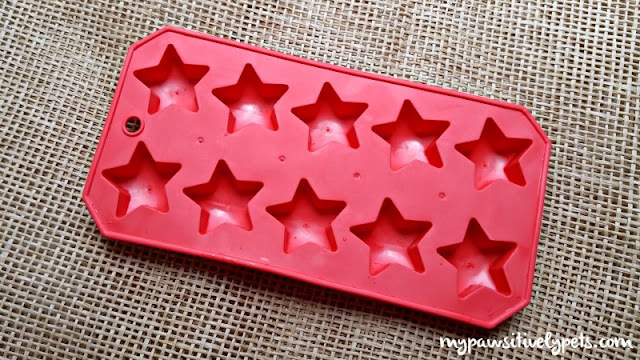 I've frozen chunks of watermelon inside ice cube trays, just filling the trays with water, but I never thought of blending it and then pouring in the molds. Happy 4th of July! 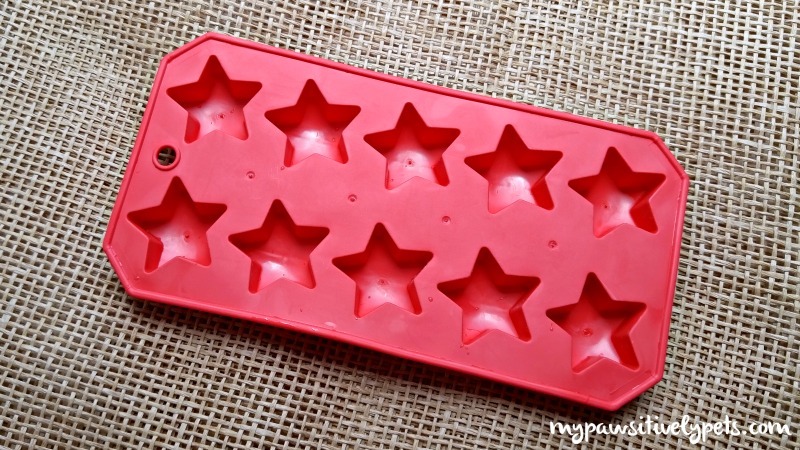 I love the smaller star molds, our mold is just for six larger stars. That is super cute! Happy 4th! Happy 4th of July! Those look like tasty treats! I’ll bet she’d appreciate some of those in her water dish. Cats like ice cubes in their water dishes when it’s hot. TW wishes she had some watermelon. Pop doesn’t like it and sez it’s too expensive for TW to buy. Yea, she might like it because she does like it when I put regular ice cubes in there. I don't like watermelon personally either. My oldest daughter does, so I'll buy it sometimes for her. When my mom was around, she would buy watermelon all the time. 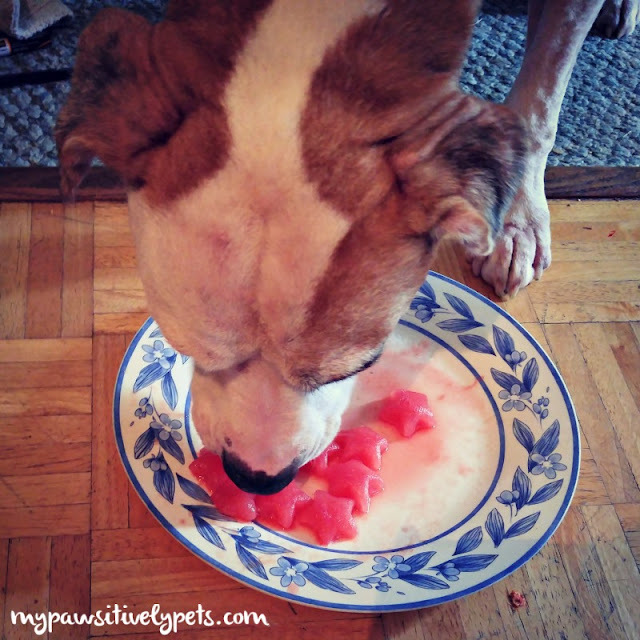 We have some frozen watermelon in our freezer, and it is one of Luke's favorite treats. Cricket will eat it, but she's not that excited about it either. Sheba, for some reason, can't eat frozen treats...they upset her stomach. So if I'm making frozen treats I always make sure she gets a sample before it goes in the freezer! I need to find some more silicone trays like those...I'll have to watch for them at the grocery store. I always find the coolest random things at my grocery store... but it's one of those really big supermarkets. That's interesting that frozen treats don't do well with Sheba. A tasty treat for the summer! I have some new silicon trays that I will be trying out this month. I hope Shiner enjoyed the Watermelon treats! Wow, what a natural patriotic food for your dogs! I love this, I am going to definitely make these for my little yorkies this summer. Thanks a lot.